The 42-year-old — the sport’s greatest drawcard — made the remarks in a question and answer session. MERCURIAL SNOOKER LEGEND Ronnie ‘Rocket’ O’Sullivan hinted on Saturday he could eschew the chance of a sixth world title describing the tournament as his least favourite. The 42-year-old — the sport’s greatest drawcard — made the remarks in a question and answer session on Twitter saying he would prefer to focus on making another series of ‘Hustle’ about globe-trotting playing pool than the world championship. 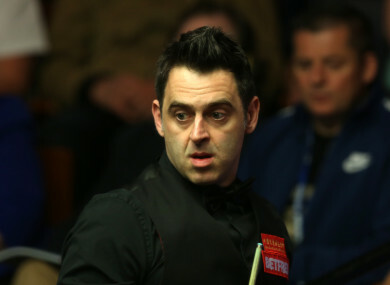 O’Sullivan wouldn’t be missing out on the opportunity of getting to within one of record-holder Stephen Hendry’s seven world crowns through a lack of form having swept three ranking titles in November and this month. The world championship at its historic home ‘The Crucible Theatre’ in Sheffield, Yorkshire, runs from April 21 to May 7 with O’Sullivan revealing he would be filming in May in Australia. “I might do,” replied O’Sullivan to a questioner regarding missing the world championships. O’Sullivan was not in the least bit concerned that he might miss out on ever breaking Hendry’s mark. Email “'Rocket' Ronnie O'Sullivan fuels speculation over missing worlds”. Feedback on “'Rocket' Ronnie O'Sullivan fuels speculation over missing worlds”.